After last season’s defensive coordinator Chris Cosh took a job offer from South Florida, Kansas State found a replacement from within. Tom Hayes joined the staff in 2011 as the secondary coach, and this season he takes the reigns of the defense as a whole. While some coordinators like the bird’s-eye view of the press box, Hayes always worked from the sidelines, and he plans to do the same this season for the Wildcats. At the Kansas State football media day on August 3, Hayes attributed this preference to two reasons. Though Kansas State’s pass defense was sometimes identified as a weakness last year, especially against the pass-happy offenses of the Big 12, the secondary over which Hayes presided in 2011 included such successful players as Walter Camp All-American Nigel Malone and All-Big 12 selections David Garrett, Tysyn Hartman and Ty Zimmerman. The defense as a whole ranked fifth in the Big 12 and second in interceptions. “The biggest difference [this year] is I am responsible for a lot more organizational things as well as the oversight of the staff and players, but I have had several of these jobs, so this is nothing new to me,” Hayes said. 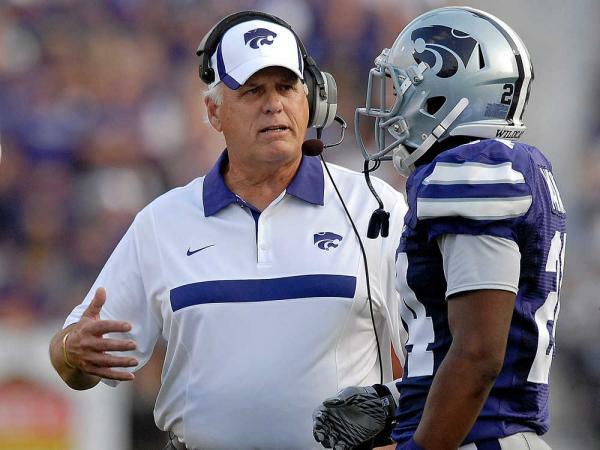 Hayes has been coaching for several decades, and as a former coordinator at both Oklahoma and Kansas, where he was also an interim head coach for several games, Hayes is no stranger to head coach Bill Snyder. In addition to his time at Oklahoma and Kansas, Hayes has also been the defensive coordinator at Stanford and UCLA. He also has NFL coaching experience, including five years coaching the defensive backs of the Washington Redskins in the 1990s and two years coaching the defensive backs of the New Orleans Saints in 2006 and 2007. While Snyder said the NFL experience is not the most significant part of Hayes’ resume to him because NFL football is different from college football, he said it definitely contributes to his overall prowess as a football coach. With so many years of coaching under his belt, Hayes said he has learned from many other coaches, and that will help him this season. The Wildcats may not have 4- of 5-star recruits, but they have heart. I think that’s the only conclusion to which one can come after watching Kansas State surmount deficits week after week – most recently a 9-point fourth quarter hole against Baylor – to go 4-0 to start the season. Here’s my evaluation of the different units in Saturday’s game. Collin Klein is not Robert Griffin III, but he had another solid, gritty performance on Saturday, and once again, his team won. He completed 13 of 28 passes – slightly under 50 percent – for 146 yards and threw one interception, but his north-and-south running netted the Wildcats another 113 yards. Running backs John Hubert and Angelo Pease did not gain 100 yards combined, but they complemented each other well and each had a long run and a touchdown. Klein utilized Hubert as a receiver as well as a runner, but he also involved wide receiver Chris Harper and tight end Andre McDonald. 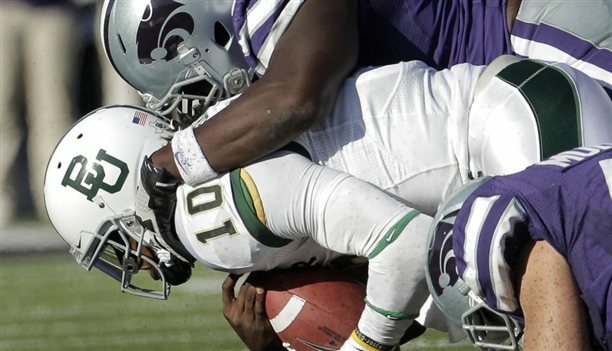 While totaling 356 yards of offense, Kansas State kept Baylor’s offense off the field for 38 minutes and 47 seconds. That did not make the defense’s job easy by any stretch of the imagination, but it helped. Of course, the Wildcats did not punch the ball in the way they should have, settling for two field goals in the first half. If they can put it in the end zone in those situations, it’s 21-7 going into the second quarter instead of 13-7. All in all, the team did what it could do – not necessarily to the very best of its abilities, but it moved the ball in a steady, workmanlike manner and got the job done. Kansas State gave up numerous big plays to Baylor, who scored touchdowns on a 43-yard pass, 42-yard pass, 35-yard pass and 34-yard pass from Griffin throughout the game. The secondary got outrun on too many occasions than is normally workable. However, the defense also sacked Griffin five times and forced him into eight incompletions and an interception. That interception was just one of the Bear’s three turnovers – the Wildcats also recovered two fumbles by Baylor. They held the Bears’ prolific offense to only 429 yards … a massive improvement from the 638 yards the Wildcats allowed Baylor last season. There have been skeptics of the Kansas State defense … after the first two games, even after the Miami game. I don’t know how skeptical people can be now, though. The special teams unit got off to a great start by forcing Baylor to fumble on a kickoff return. However, it waffled throughout the game. Kicker Anthony Cantele made three field goals, including the game-winner. On the other hand, Baylor had decent-to-good field possession on several occasions, including once after Kansas State allowed a 42-yard return. That was the reaction senior cornerbacks Tysyn Hartman and David Garrett had as they watched film of this year’s defense. What’s the difference that compelled them to comment as they did? Speed. Hartman said the defense as a whole is much faster, and defensive linemen in particular are pursuing the ball in a way their teammates down the field greatly appreciated. When Kansas State’s defense takes the field on Saturday, many fans might recognize only one of the front four. 6’4″ and 305-pound senior Ray Kibble, who started nine games last season and played in all 13, will anchor the defense as the nose tackle. The other defensive tackle will be 6’2″ and 280-pound Vai Lutui, a transfer who amassed 63 tackles last season while helping his Mount San Antonio Community College team to a 13-0 record and national championship win. At defensive end, 6’3″ and 250-pound Jordan Voelker (son of Randall Voelker, a three-year offensive tackle for the Wildcats) has worked his way into the starting lineup after seeing time in five games last season. On the other end is 6’0″ and 254-pound Adam Davis, a prized recruit who had to redshirt last season because of an injury after playing at Hutchinson Community College in 2009. The members of this season’s defensive line have the tough task of shoring up a unit that last season allowed the most rushing yards per game in the Big 12 and nearly the most in the entire nation. While players said those numbers disappointed them, they use them for motivation without holding on to them. 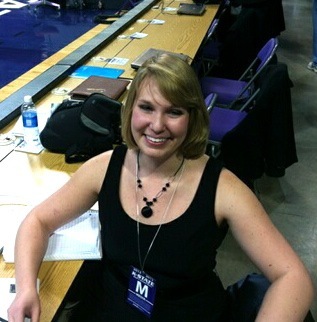 I'm Ashley Dunkak, a senior at Kansas State University majoring in journalism and minoring in Spanish and economics. This is my third year covering football and men's basketball for the Associated Press. Long story short, I love sports, and I love to write about them and talk about them - often. I graduate in May 2013, so if you or someone you know need to hire a full-time sportswriter beginning that month, please feel free to contact me. Frank Martin practices ‘harder’ than Mike Rice practices?